While winter in the Cincinnati area can mean snow ball fights with the family, decorating for the holidays, and a ride on the “North Pole Express” around LM&M Railroad Junction, it can also mean a huge increase in heating bills and energy costs to keep your family and home comfortably warm all season. Installing a more energy efficient furnace is just one way to cut costs. If you’re interested in scheduling your free estimate for a qualifying heating system replacement or installation, call Rick’s Heating & Cooling at 513-899-6005 or contact us online! Our experienced and licensed HVAC technicians can help with all your heating needs through the Ohio area to ensure that your heating system is working as effectively and efficiently as possible. Want more ways to save? Here are 10 ways to save money on your heating bills during the cold season in Ohio. Invest in a new furnace system – this can be expensive, but you will continue to save on heating bills all season long with a newer, more efficient heating system. Install a programmable thermostat – this is one of the easiest and most effective ways to save money on your heating bills. By pre-setting a lower temperature when you’re away from home and programming it to rise just before you arrive back after a day of errands or work, you can avoiding wasting heat on an empty house. Turn down the water heater – the U.S. Department of Energy recommends that you set your thermostat on your water heater to 120 degrees. Check to see what yours is set at right now, it might be higher than that and wasting you money. Utilize your curtains – windows are a large source of heat loss in the winter. While it might feel good to have the bright sun heat up a room on the weekend, keep curtains closed at night and when you’re not home to prevent warmth from escaping. Fix duct leaks – if your rooms are inconsistent in temperature, you may have leaky ducts that may also be leading to higher heating bills. Get a furnace inspection – it is recommended that you have your gas or oil furnace inspected once a year, ideally before heating season fully kicks off. Having a professional furnace tune-up can ensure that your system is running at maximum capacity and isn’t exhausting your wallet each month. Block drafts – drafty windows and doors can be a drain on the heat that your system is producing. Ensure that all cracks and gaps are sealed to keep your home more insulated and warm. Bundle up! – this is an easy fix, but if you and your family bundle up, you can turn the thermostat down. By adjusting the heat to even just a few degrees cooler, you can save each month. Get a whole–house humidifier – in the winter, humidity levels drop, making your home feel cooler than it is. Often times, people will crank up their furnaces to combat this change, but by installing a whole-house humidifier, your house can return to optimal humidity levels throughout the winter and feel warmer. Seal your fireplace – if you aren’t using your fireplace to keep your family warm, consider sealing it. Warmed air that you are paying for can easily escape up the chimney. Check your flue damper to ensure that it is sealed as tightly as possible. With all of these money saving tips, you might not know where to start. While installing a new heating system is a great investment in itself, equipping your home with a programmable thermostat and humidifier can help you save even more this winter. 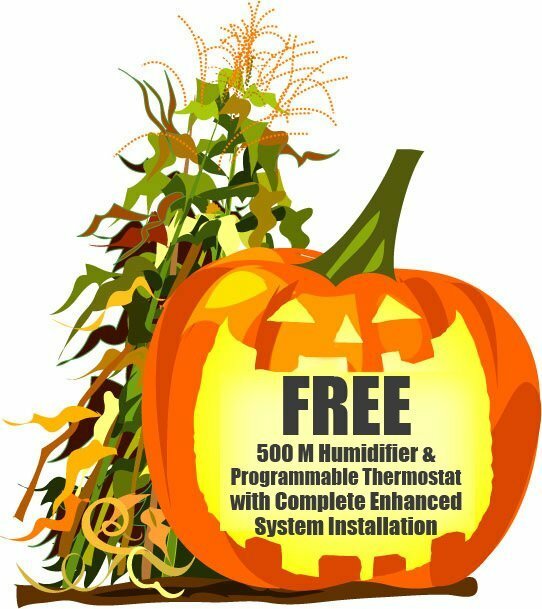 During this month of October, Rick’s Heating & Cooling is allowing you to save even more when you mention this coupon—benefit from a free programmable thermostat and 500 M humidifier when you purchase and install a new complete enhanced system. This offer expires soon, so act fast to start saving on those bills! Rick’s Heating & Cooling is a fully licensed and insured HVAC company in Morrow, OH, and our licensed and professional technicians can help you improve your Cincinnati area home’s comfort and heating system’s performance during the cold winters ahead. Call today for furnace services in Hamilton, Cincinnati, Lebanon, or the surrounding Ohio areas! *This offer EXPIRED October 31, 2013. Call today (513-899-6005) for our current promotions.